Talking to Cromwell Littlejohn at Merle Wood & Associates, he confirms that he’s recently signed a joint central agency (with Jonathan Barbe of Edmiston) for the sale of Marinteknik’s 43m Griff. 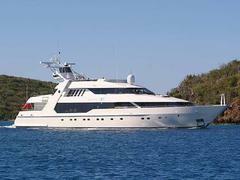 Built in 1994 and refitted in 2006, she has a versatile layout featuring six cabins and a gymnasium, plus a full beam saloon, private library and contemporary décor. Crom comments that, “She’s very anxiously offered as an estate sale.” Griff is asking $6.9 million and is not for sale to US residents while in US waters.